Oh my goodness, that's amazing!!! Might be time to pull out the old cross stitching gear! This is awesome! I knew was it was immediately, and I LOVE the little foot prints! I looove this! I recognized that phrase the second I saw it! (One of my favorite phrases in the whole book.) 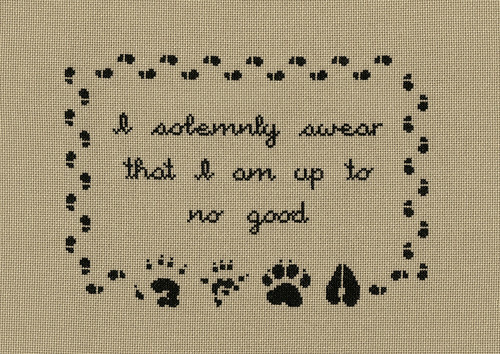 I have a key chain that says that on the front... and the back says "mischief managed". I love the footprint border Shae created. So clever! I am a huuuuge HP fan; so this is awesome!!! The footprints are so cute! Great job!! love it! made me smile.